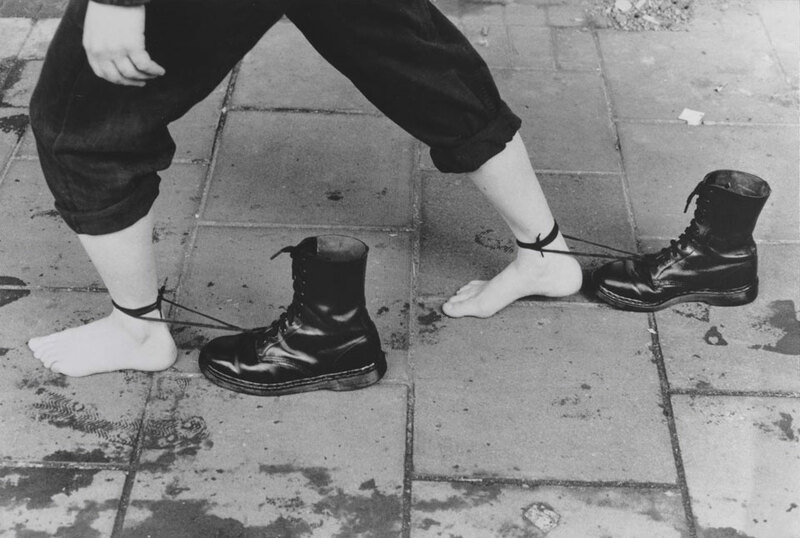 In 1985 Mona Hatoum performed Roadworks, a one-hour performance in which she walked through the streets of Brixton in London. The piece was recorded and the video documentation later edited into a six-minute colour video.1 This video, which has the same title as the performance, was then shown in exhibitions, usually on a television monitor. Ten years later Hatoum extracted a still from the video, cropped the image and printed it as a black and white photograph before mounting it on aluminium. The resulting work, Performance Still 1985–95 (Tate P80087), is always displayed directly on the floor and leaning against a wall.2 The translation of this work from live performance, to video and then photographic documentation exemplifies how the audience and context of an artwork changes through different media. Before it was the name of Hatoum’s live work, ‘roadworks’ was the title for the three-week-long group exhibition of which it was a part.3 ROADWORKS was initiated by the artist Stefan Szczelkun and took place at the Brixton Art Gallery in South London between 18 May and 8 June 1985.4 Ten artists – Rasheed Araeen, Marc Elmes, Mona Hatoum, John Hewitt, Kasia Januszko, Roland Miller, Carlyle Reedy, Ian Sherman, Kumiko Shimizu and Gennaro Telaro – were invited to present works outside the gallery, to document them, and to then display the documentation, drawings and photographs related to the performances in the gallery. As a result, the exhibition changed daily and expanded continuously. Hatoum created several live works including Roadworks on 21 May 1985. For this performance she walked out of the gallery – with bare feet and wearing a black work overall rolled up to her calves – through the market and arcades of Brixton and back to the gallery, dragging behind her a pair of black Dr. Martens boots tied to her ankles by their laces. The day after, she performed Untitled 1985 with Stefan Szczelkun. For that piece she and Szczelkun fell onto the floor one after the other, drawing the outline of the other’s body with chalk onto the pavement. On 24 May, Hatoum then stood behind a screen of newspaper stretched between two pillars and, following a series of actions using red paint and a brush, she revealed herself by breaking through the paper. Most of the actions presented by the ten artists were unannounced. The focus of the exhibition was to make art-making public and consequently to reach a wider audience. The artist recalled the audience’s reactions to her piece: ‘One comment I really liked was when a group of builders, standing having their lunch break, said ‘What the hell is happening here? What is she up to? And this black woman, passing by with her shopping, said to them, ‘Well it’s obvious. She’s being followed by the police’. Hatoum added: ‘One guy came up to me and said: Excuse me. Do you know you’re being followed?’7 Hatoum’s black boots were (and are) a symbol of the punk movement, but were also part of the uniform of the often violent and racist groups of skinheads as well as the police. In this piece the footwear can be seen as a signifier of a measure or condition that keeps someone under control, a symbol of oppression. Roadworks was concerned with ideas of control, individual struggle and social conditioning, which resonated both generally and specifically in the local context. In the photograph Performance Still the context of Brixton in the 1980s is no longer clearly legible in the work. The artist cropped the image, so that it shows only the bottom half of her legs and the boots on the pavement. The composition of the photograph plays with dualities and thus accentuates the fragility of the bare feet against the roughness of the street and the heavy boots. The work continues to provoke questions about control and social conditioning, but as the figure is now isolated from its surroundings, it loses the site-specificity of the social and political context of south London in the 1980s. The photograph is mounted on a rigid aluminium sheet so that it can be displayed directly on the floor, leaning against a wall. As such Performance Still is not only a photograph, but also a sculptural object. The unusual mode of presentation draws parallels between the pavement of the street on which the action once took place, and the floor of the exhibition space on which the photograph is now displayed. Could these be interchangeable, transforming the exhibition space into the site of the action? Likewise this mode of display means that the feet in the photograph mirror those of the viewer, an effect compounded by its life-size scale. The work asks the viewer to consider what it would be like to follow the performer’s footsteps or put themselves in her place, without shoes. While this might be an antagonistic invitation, it may also be a call for solidarity, for the viewer to join her in a protest march. In 1985 Hatoum used her own body in this work; she was the performer, the one at the centre of the action and the one conveying the message to onlookers. In this sculptural photograph, the roles are reversed: it is now the audience’s feet – their location and mobility – that come into focus. Performance Still creates a situation to which the audience can bring their own experience. This activation of the viewer is representative of a change in Hatoum’s practice from the early 1990s when she shifted from working in performance and video to making installation and sculpture. She explained this transition: ‘In the early performance work I was in a sense demonstrating or delivering a message to the viewer. With the installation work, I wanted to implicate the viewer in a phenomenological situation where the experience is more physical and direct.’8 The migration between media in Roadworks and Performance Still exemplifies this transition in the artist’s practice – from live and durational works to object-based works, from the artist’s body as a performer to the one of the audience as directly interacting with the work, and from narration to an open-ended proposition. In the annotated catalogue raisonné of Hatoum’s performances curator Christoph Heinrich described how the later photographic iteration also altered the symbolic resonance of Roadworks: ‘As a result of the edition of Performance Still (1985–95) published ten years later, the Roadworks performance became a synonym for Mona Hatoum’s work’.9 Performance Still is no longer an image of a single work, Roadworks, but one that embodies Hatoum’s practice. It encapsulates the traumatic and political themes of her work, her performance-based practice as well as her departure from it, and her desire to engage more directly with the audience. 1. Roadworks 1985, video VHS, colour 6min 45s. Collection Centre Pompidou, Musée National d’art moderne, Paris. 2. Tate’s example of Performance Still is number two from an edition of fifteen, and was acquired in 2012. 3. Much of the printed matter published for and around the event is available on the Brixton Art Gallery Archive website, http://brixton50.co.uk/roadworks/, accessed 1 September 2015. 4. The records of the Brixton Artists’ Collective at Brixton Art Gallery was acquired by Tate Archive in 2012 (TGA 201211). 5. Roadworks, exhibition catalogue, Brixton Art Gallery 1985. 7. Sara Diamond, ‘Interview with Mona Hatoum, 1987’, in Mona Hatoum, London 1997, p.131. 8. Janine Antoni, ‘Mona Hatoum’, BOMB, Spring 1998, http://bombmagazine.org/article/2130/mona-hatoum, accessed 1 November 2015. 9. Christoph Heinrich, ‘Artist at Work: An Annotated Catalogue Raisonné of the Performances’, in Mona Hatoum, Berlin 2004, p.113. Guy Brett, ‘Roadworks’, Artscribe, no.53, 1985, p.61. Mona Hatoum, ‘Body & Text’, Third Text, vol.1, no.1, Autumn 1987, pp.26–33. Guy Brett, ‘Tissues of Thought’, Third Text, vol.22, no.2, March 2008, pp.237–56. Capucine Perrot, 'Mona Hatoum, Performance Still 1985–95', in Performance At Tate: Into the Space of Art, Tate Research Publication, 2016, https://www.tate.org.uk/research/publications/performance-at-tate/perspectives/mona-hatoum, accessed 20 April 2019.